Worldwide: 3300 species in more than 450 genera. Most species are parasitoids of Homopteran bugs (Coccidae, Diaspididae, Pseudococcidae), but a wide variety of other insects and arachnids are also targeted: eggs or larvae of beetles (Coleoptera), flies (Diptera), butterflies and moths (Lepidoptera), lacewings (Neuroptera), grasshoppers (Orthoptera), bugs (Heteroptera), tick nymphs or spider eggs (Arachnida). Some species are parasitoids or hyperparasitoids of other wasps (Hymenoptera). Annecke, D.P. & Insley, H.P. 1971, Catalogue of Ethiopian Encyrtidae and Aphelinidae. Entomology Memoir of the Department of Agricultural Technical Services of the Republic of South Africa 23: 1-53. Noyes, J.S. & Prinsloo, G.L. 1998, A review of the Afrotropical and Malagasy taxa of Encyrtidae (Hymenoptera: Chalcidoidea) described by J. Risbec (1949-1959). Annales de la Société Entomologique de France 34(1): 71-97. Prinsloo, G.L. 1983, A parasitoid-host index of Afrotropical Encyrtidae (Hymenoptera: Chalcidoidea). Entomology Memoirs of the Department of Agriculture, Republic of South Africa 60: 1-35. Prinsloo, G.L. & D.P. Annecke. 1979. 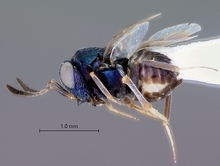 A key to the genera of Encyrtidae from the Ethiopian region, with descriptions of three new genera (Hymenoptera: Chalcidoidea). Journal of the Entomological Society of Southern Africa 42: 349-382.